Frantz Fanon, Iconic psychiatrist and author of books such as “Wretched of the Earth”, wrote that “literature increasingly involves itself in its only real task, which is to get society to reflect and mediate”. 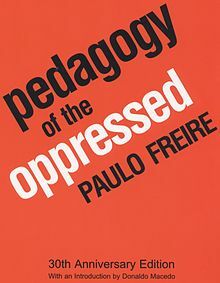 Paulo Freire’s landmark book, “Pedagogy of the Oppressed” is a prime example of literature that makes one reflect, cogitate and ponder all at once. In addition, Freire’s “Pedagogy” is also the archetypal case in point of a book, which is just as relevant today as it was decades ago. Freire was a Brazilian educator, who grew up during the poverty of the Great Depression in the 1930s and published one of his seminal works “Pedagogy of the Oppressed”, in English in 1970. Freire’s book, rooted in his experience of liberation in Brazil is equally apt in the context of the Arab Spring, and particularly after the death of Gaddafi last week. One of Freire’s central tenets was that “education is freedom” that leads toward true liberation and that the “banking” concept of education- where students are empty vessels to be filled, acts as an instrument of oppression. He called on the cultivation of a critical consciousness (conscientizacao), enabling those to reflect upon their own reality and thereby transform it. “How can the oppressed, as divided, unauthentic beings, participate in developing the pedagogy of their liberation” Freire asks? It is this concept of the oppressed initiating and participating in their own liberation, as was the case in the Arab Spring, which was central to Freire’s writing. Freire explains: “Revolution is born as a social entity within the oppressor society…Every entity develops (or is transformed within itself, through the interplay of its contradictions. External conditioners, while necessary, are effective only if they coincide with those potentialities”. It is a sentiment shared by many involved in the Arab Revolution, including Ahmed Farid, an Egyptian lawyer and peace activist working in Alexandria, Egypt. Speaking with Farid he speaks optimistically and passionately: “For centuries the Arab countries lived in an automatic and dictatorial regime. People were yearning for justice and equality for democracy and freedoms but with no effective result UNTIL the revolution came. It was not a revolution of the hungry or the miserable, though lots of people were in need, but it was a revolution for dignity and self respect”. Farid continues: “from Tunisia when a police woman slapped Mohamed Bo Azizi when he asked for his rights and he decided to commit a suicide then all the Tunisians went out from their homes and demonstrated against the regime and they succeeded. Then it [the revolution] came to Egypt and the regime said Egypt is not like Tunisia but the Egyptians made it, they made it in a peaceful and modern way that attracted the attention of the whole world. Freire’s work, often cited in peace education discourses, also highlights the real potentiality of the oppressed becoming the oppressors, which seems particularly timely given the discovery of 53 bodies of executed Gaddafi loyalists, reported by Kim Sengupta. “[Dehumanization of the oppressed] …is a distortion of being more fully human, sooner or later being less human leads the oppressed to struggle against those who made them so. In order for this struggle to have meaning, the oppressed must not, in seeking to regain their humanity, become in turn oppressors of the oppressors, but rather restorers of the humanity of both”.